Mix together first 4 ingredients in bowl. Cut butter into 1-cm cubes, and add in. Use the back of a fork, or two knives to work into the flour. When flour is crumbly, add in buttermilk all at once. Be careful NOT to knead the dough, or else you will form glutens and the biscuits will not be fluffy. Gather dough into a ball, roll into rectangular sheet of 1/2" thick. Create rounds using a cookie cutter. Gather remaining scrap dough into a ball, making more biscuits until all dough is gone. Brush generous amounts of buttermilk on tops of biscuits before baking, will brown nicely. Bake for 18 minutes at 400 degrees F.
Whisk together first section's ingredients. Then add crabmeat, egg, green onions, and 10 Tbsp processed Panko crumbs. Roll cakes in remaining breadcrumbs to coat. Fry in olive oil over medium heat until golden brown, or about 4 minutes per side. 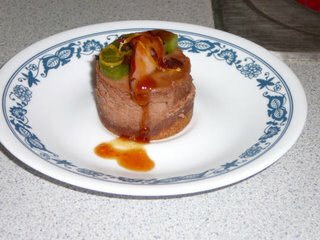 Serve with roasted pepper sauce and fresh cilantro for garnish. 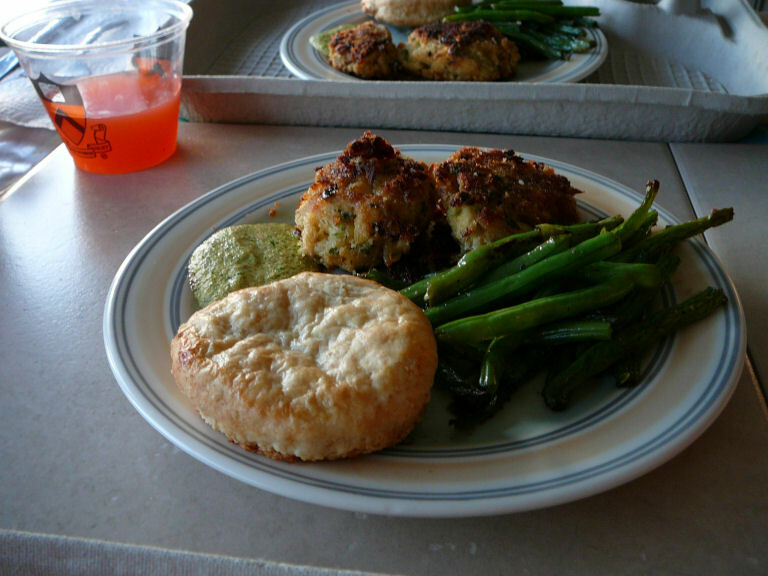 Ensemble picture of Panko Crab Cakes, Ginger Sauteed Green Beans, Roasted Pepper Aioli, Buttermilk Biscuits, and Pink Lemonade. For dessert, chocolate cheesecake with rum apricot glaze, fresh fruit and chocolate shavings.